Cat and Jon travelled halfway around the world to find their perfect elopement destination. This wildly romantic couple knew that if you’re eloping into the wild, then you better make sure they do it well. 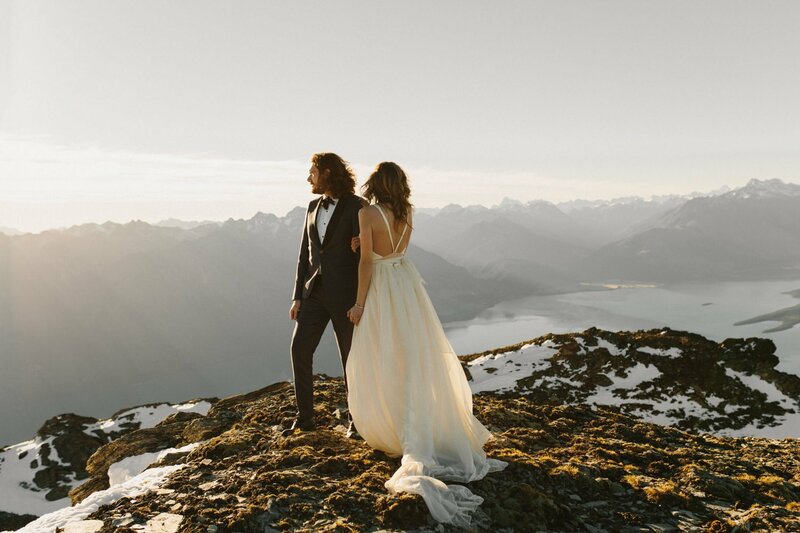 An adventurous Queenstown Elopement fit their vision perfectly! 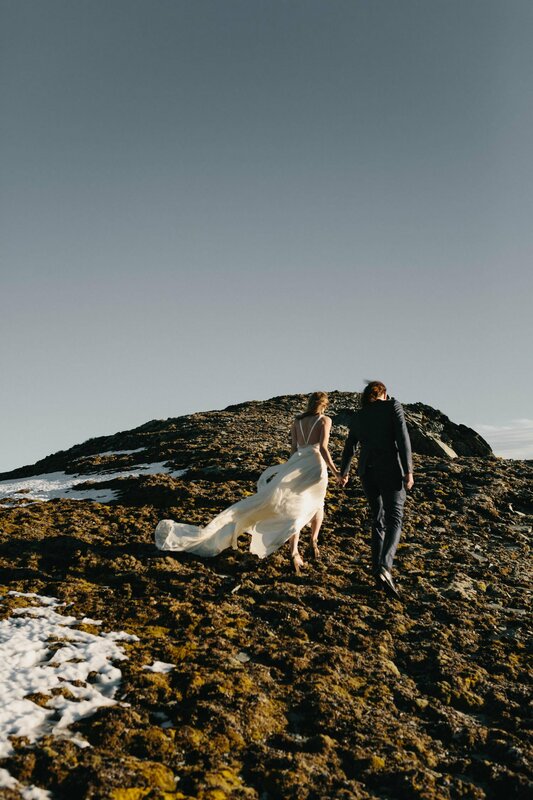 Cat and Jon wanted their intimate elopement to be unique, to tell a story and to involve plenty of adventure, romance and stunning views. 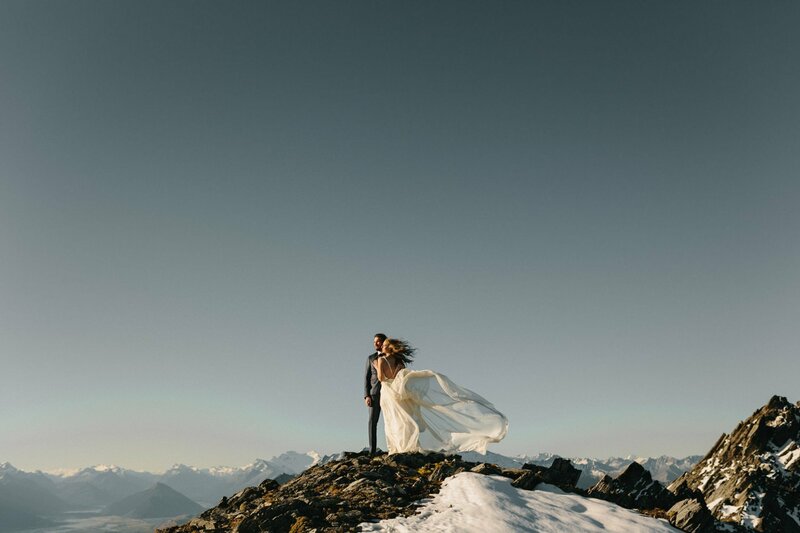 They were seeking an elopement photographer who understood their vision and could guide them through the options and challenges of backcountry photography. As a stylist, Cat had a clear idea of what she wanted to achieve. The creative couple connected with my work and were drawn to the editorial style and painterly attributes of my photography. They also wanted a photographer who had confidence in the mountains and wouldn’t limit their options for locations. The union of Cat and Jon was not one that followed the norm. They chose to get off the beaten track, get into the wild and fly to the top of a mountain by helicopter. 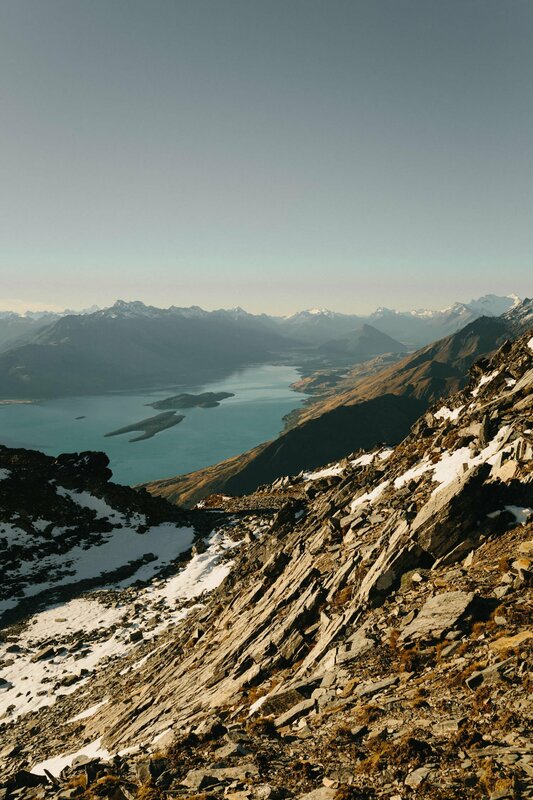 And this is how we found ourselves atop Mt Creighton halfway between Queenstown and Glenorchy on a perfectly still evening. Mt Creighton had recently experienced a rare summer snowfall. The light dusting perfectly framed the views over Lake Wakatipu towards Glenorchy and Mount Earnslaw. 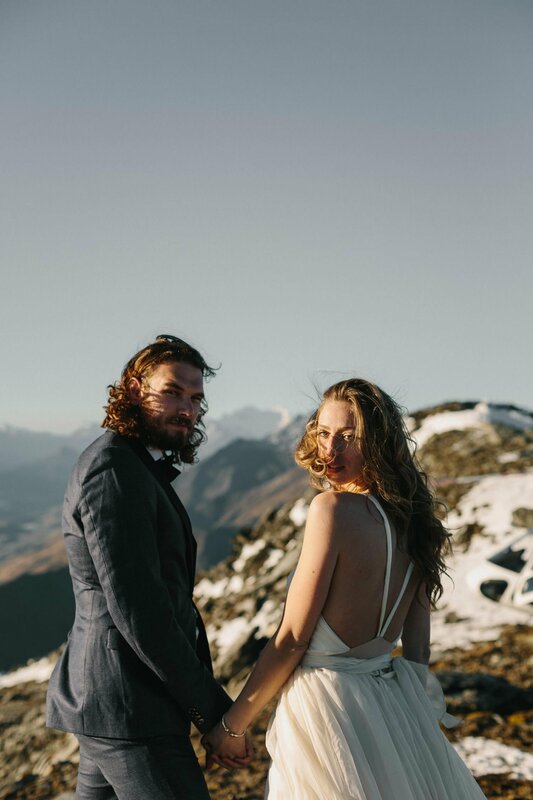 With Cat in a white, flowing 1920s-style dress and Jon in a sharp, classic black tuxedo, the couple exchanged informal vows before exploring the summit for photos. Cat came prepared for chilly weather with a fur wrap, blanket, spare jacket and shoes. But the mild evening meant that Cat valiantly hiked the hilltop in her heels. Soon, the sun set slowly behind the peak, creating a soft, luminous light for final photos. Cat’s long dress caught the gentle breeze and moved beautifully behind her. The movement, the light, the outfits, the intimacy and the mountain backdrop, were all breathtaking. Exactly as Cat and Jon had envisioned. And of course, the helicopter completes the story. Without the heli, Cat and Jon would not have been able to make their unique vision a reality. Observed from afar and with majestic beauty surrounding them, Cat and Jon had space to lose themselves in the moment. The result is natural, candid, creative and romantic photos. With everything just as they wanted it, Cat and Jon were able to give themselves to each other, as they stood together on top of the world.